(This will be the design for the site in October or November of 2009!) 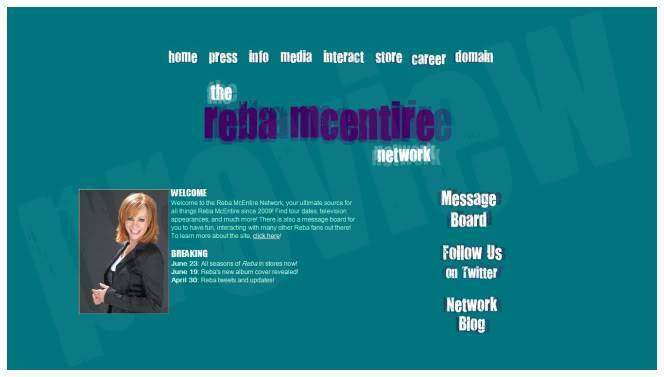 Below is a design for The Reba McEntire Network. We have worked on it for a while, and we are giving you a preview of it. Take a look at it. This design is just an idea for the site, and it may change prior to when we will change the design next. For now, here's the planned design! We will definitely add a picture of Reba on the homepage. We'll give you an updated look at the preview when we have that! Re: New Design for the site! I love the new site! And the picture your using is on of my favourite pictures of Reba! But since your background is blue what about using the picture of her new CD. It would look amazing on that page because it has a lot of blue in it. I'm glad you like it. At the moment, we are still thinking of new ideas for the site design, as it won't be changing 'til at least August! But what a great idea to use the picture of her new CD! I think that would look really cool. Thanks for your suggestion! YES it should be the new design. I love it. Thanks Janina. Okay, I've taken many votes for this design, and not one person said no to it. So that means that this will be the new design. I might use MUSICIAN3133's idea of using Reba's new album cover on the homepage!